Diffusing essential oil blends is a great way to fill your home with the different scents of the season. There are several essential oil combinations that you can experiment with to produce aromas that are evocative of the holidays. The key lies in knowing a few basic blend recipes and then customizing them to your preferences. If for you Christmas means all things gingerbread, you are sure to have fun experimenting with variations of these Gingerbread Essential Oil Blends. Love that fresh, invigorating aroma of a real Christmas tree? While it may be impractical to keep a real tree in every room, you can still recreate that distinctive scent with these essential oil blends that smell of a Christmas tree. Fruity Christmas blends are another popular type of seasonal scent. The Christmas Cider blend smells just like cider. Put a few drops of this blend in your diffuser to make the inside of your home smell just like you have made a big bowl of fresh cider. There are quite a few variations of this blend, but it typically starts with sweet orange essential oil to which you add your choice of spicy oils. Some spices that work well in the Christmas Cider Blend are nutmeg and cinnamon. You can add clove to this, or replace the cinnamon with the clove. The Peppermint Twist Blend uses just two essential oils – peppermint and ylang ylang. The peppermint oil emits an aroma that is similar to candy canes, which is already a hugely popular Christmas scent. Ylang ylang is a floral scent, which helps bring out the minty and fruity scents of the peppermint. These two oils blend very well together. Why not try a fun blend with orange and some spices? This is a wonderful fruity Christmas blend that provides the perfect combination of sweet, citrus fruit and holiday spices. You start with any sweet orange essential oil, which has a sweet Christmassy scent. You can then add in some clove oil for the classic Christmas spice element, along with a little rosemary essential oil to really bring it over the top. Be careful not to add too much clove oil as it has a very strong aroma that can overpower the other scents if you add too much. The fruity candies blend smells similar to candy canes and other fruity candies you have at Christmastime. Instead of orange, you are going to use lemon for this particular blend. Citrus fruits are popular during the holiday season, so it is perfect. You will then add some peppermint essential oil to balance out the citrus flavor and a little lavender to give the blend some sweet floral notes. 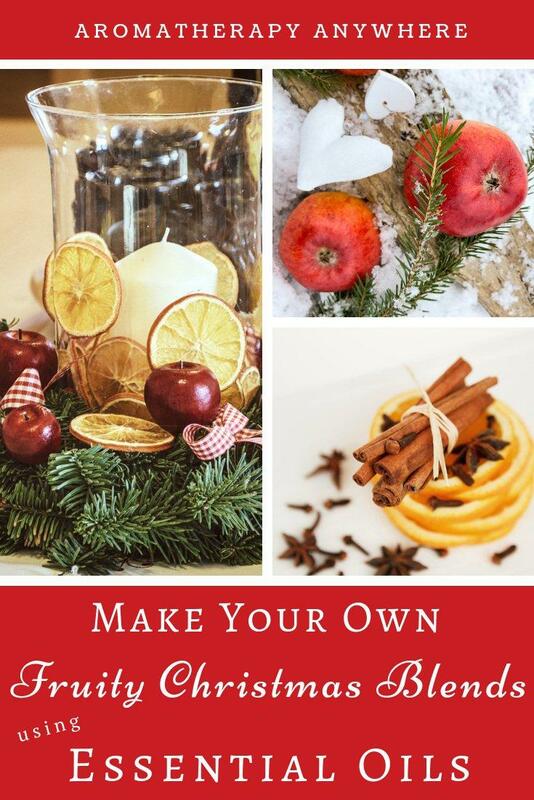 Love the thought of creating your own Fruity Christmas blends but just don’t have the time? Check out Christmas blends created by Plant Therapy. While you can diffuse fruity essential blends in any room, this particular aroma is just perfect for the kitchen and dining room. There are several ways you can use this blend in your kitchen or dining room. Put a few drops in your favorite diffuser. Scent a few pine cones and place them in your kitchen cabinets or scatter a few on your worktop. Create unique tabletop decor using pine cones scented with fruity essential oil blends. Make your own potpourri sachets and scent them with your favorite fruity essential oil blend. 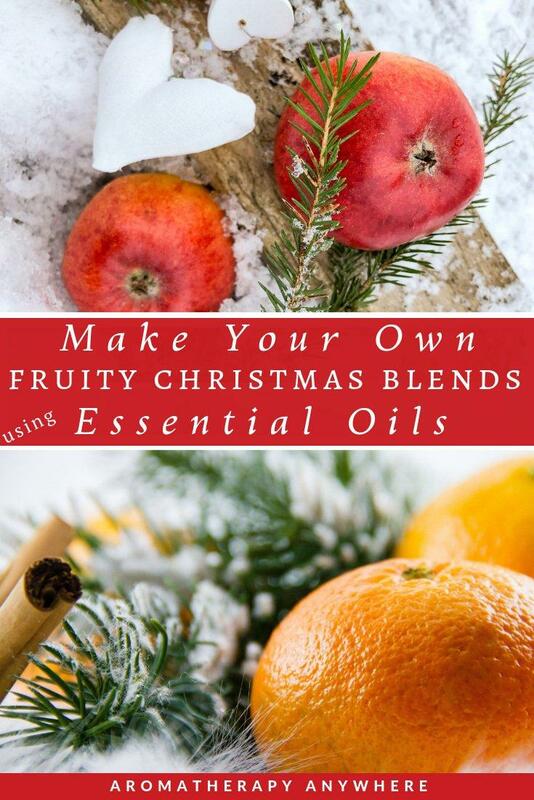 Which is your favorite way to use fruity essential oil blends during the Holiday season? Let us know in the comments below. Previous Post: « Aromatherapy Gift Ideas: What’s Inside Your Aromatherapy Gift Basket?